Click here to watch the video trip report for this creek. 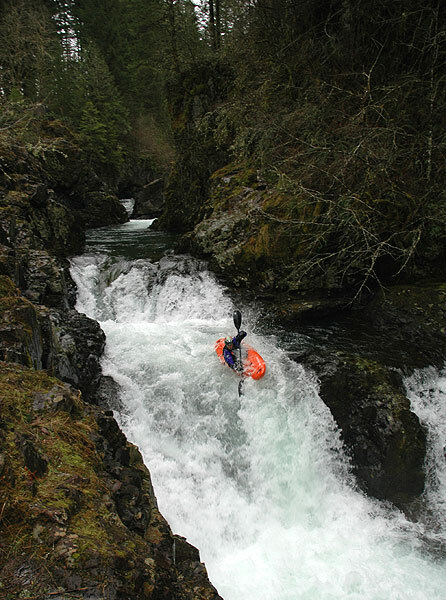 Copper Creek is yet another quality run located a short distance north of Portland, just across the Washington border. Copper is a tributary of the popular waterfall run on the East Fork of the Lewis, entering the East Fork just upstream of Horseshoe Falls. I'm not exactly sure why it took me so long to run Copper Creek. I guess it's because when this one has water everything else is running as well, so I always had something else to do. Plus, Copper is kind of short, and though it has quality drops I'd heard that the good stuff is separated by long, mellow class two sections. On this trip Pete and I were joined by Brad Coleman, EJ Etherington, James Bagley Jr., and Jesse Coombs. Pete was the only person in the group who had run the creek before, so we were a little bit unsure about flows and even access points. On the drive up we consulted the guidebook and decided to put in at the first bridge ( see the map at the end of this report ) just above the rapid known as 'certain death'. Discussing the finer points of running waterfalls at the put-in for Copper Creek. We put on and bounced downstream for a couple of hundred yards until we arrived at a big horizon line which could only be 'Certain Death'. We got out to scout on the left, but soon discovered that the best scouting is on the right hand side. After studying the drop, Jesse and James decided to give it a go, while the rest of us decided to walk around it on the right. 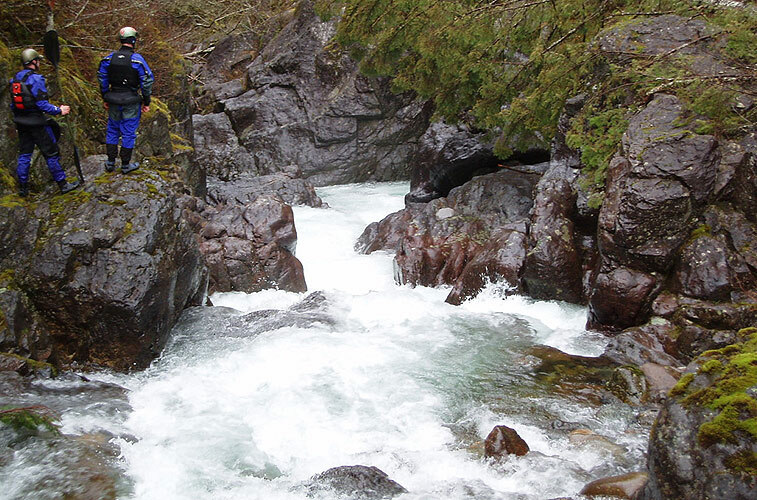 EJ and James look downstream into the rapid known as 'Certain Death'. Jesse was up first, so we set safety and he got ready to go. He approached on the right hand side, dropped into the fold on the top-right. This immediately flipped him, but he rolled back up and finished off the rapid easily. Jesse Coombs works the pillow at the entrance to 'Certain Death'. "I betcha he hikes up and runs it again." I said to EJ. "I wouldn't take that bet." EJ replied. 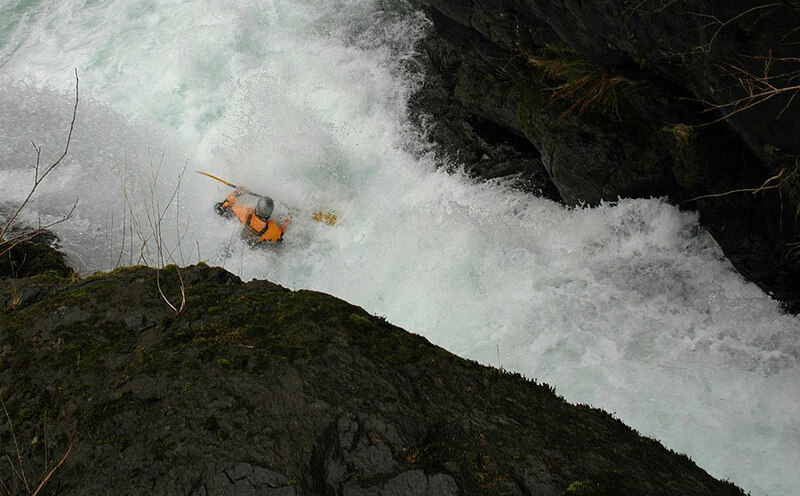 Sure enough, Jesse hauled his boat out and started hiking back upstream to run the rapid again. Meanwhile, James was in his boat and approaching the lip. He decided to go for the boof in the middle, hit it nicely, but also flipped immediately in the violent slot below the entrance move. James also rolled up instantly and finished the rapid in good form..
A sequence of James Bagley Jr. avoiding the outside corner pocket at the bottom of 'Certain Death'. By this time Jesse was back in the pool above Certain Death, and he dropped in, running the same line as before. This time he was ready for the weird currents in the slot though, and did a deep brace and came through upright, finishing the rapid with a nice boof into the pool below. Below Certain Death the creek gets very wide, and this is where we started to wish we had more water. 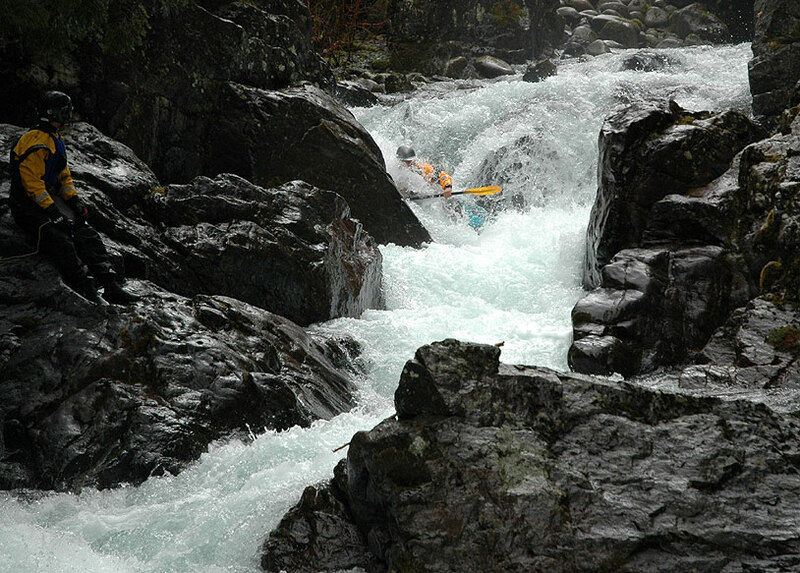 Copper Creek is a study in contrasts, with three really good whitewater sections separated by lots of mellow but scenic class I-II. Soon we arrived at the biggest vertical drop on Copper, called 'The Big Falls' in the Bennett guide. This drop starts with a little slide, into an eight-footer, then an eighteen foot plunge falls. We scouted this one briefly and then everybody ran the right side without problems..
Pete Giordano runs the bottom drop on 'The Big Falls' on Copper Creek..
Below Big Falls were some smaller, fun drops that lead up 'The Final Five', a short gorge with five ledges between vertical walls. The Final Five is definitely the best series of drops on this run, starting with a steep slide following by a narrow ledge, then a sliding drop into a wall and ending with a big double drop into a hole at the end of the gorge. 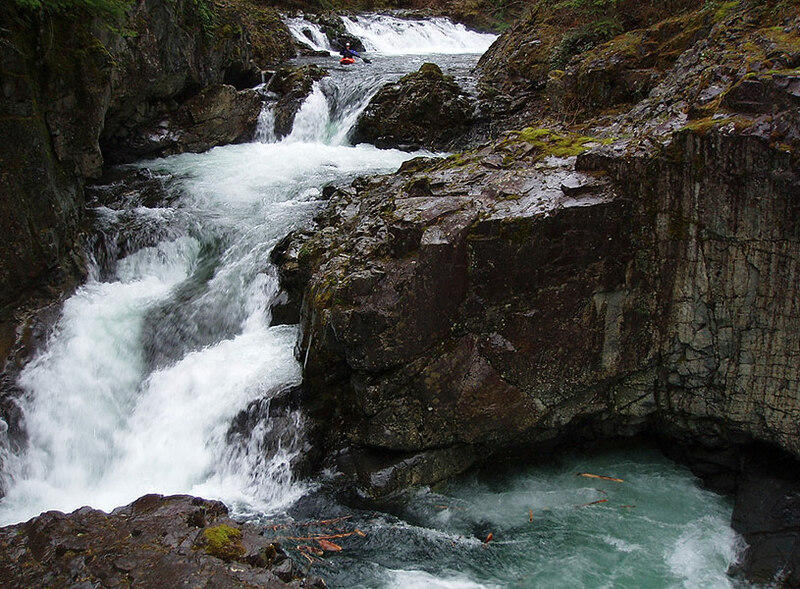 James enters the final gorge on Copper Creek, a series of ledges known as 'The Final Five'. 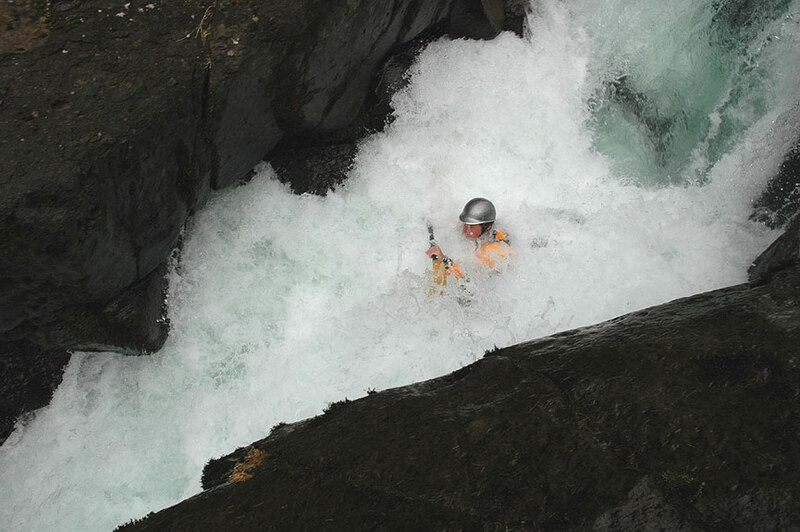 James digs in for the boof at the bottom of 'The Final Five' gorge. Below the Final Five gorge the creek is totally flat until it reaches the East Fork of the Lewis River. 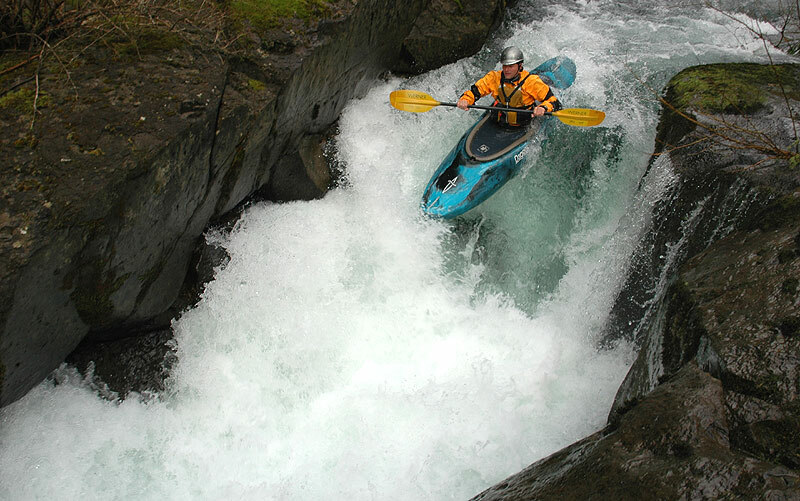 Once on the East Fork we sprinted downstream until we arrived at the Marquee drop on the East Fork, Horseshoe Falls. Horseshoe is one of the most commonly run big drops in the Northwest. 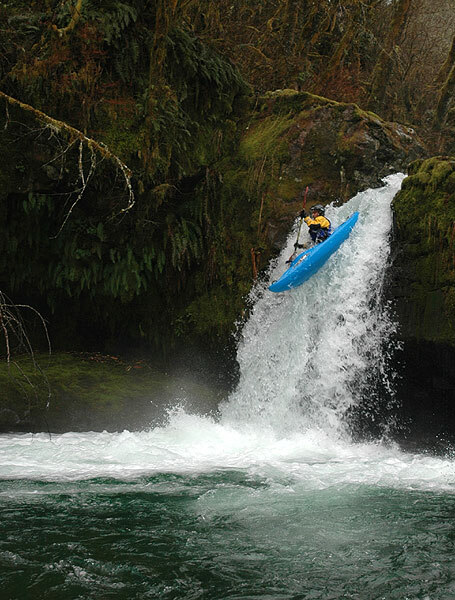 It drops a total of 22 feet, and kayakers have a choice of several 'doors' at the top. 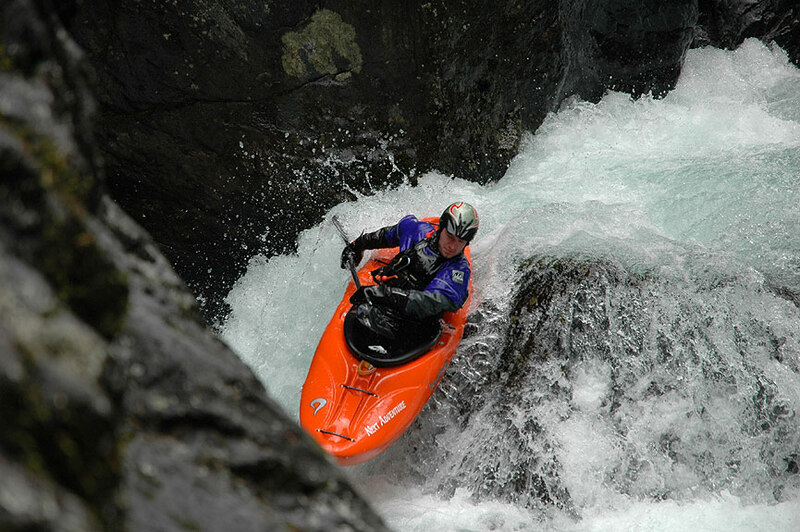 Starting on river-right is what the guidebook calls 'suicide', a foaming, evil-looking slot that cascades down through a mess of undercuts and piton rocks. The middle doors lead to the 'gimme' line, a class three slide over the main dome. Finally, there is the far left-side line, which features a technical plunge thorough a crack that careens off a rock outcropping and then plunges vertically for the final ten feet. Most of the group immediately ran the middle line, which is the usual procedure at Horseshoe. Jesse, on the other hand, decided that the right side looked good. After studying the 'Suicide line' for awhile, he decided to give it a go. 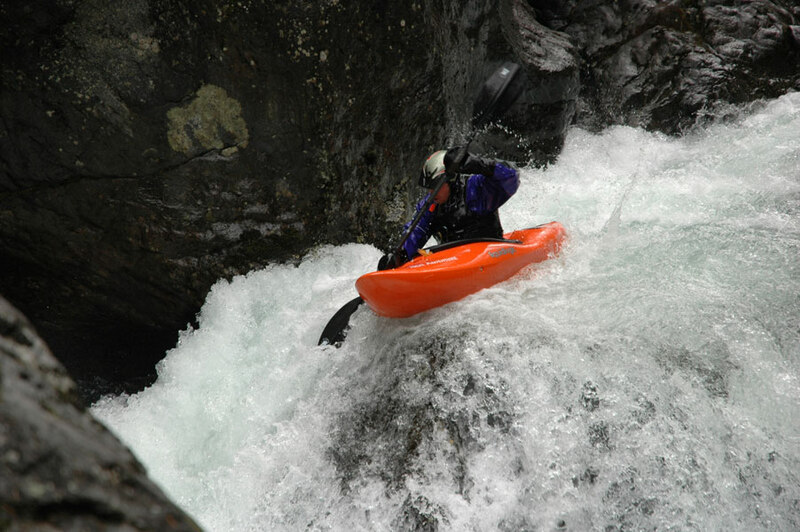 He headed upstream peeled out, and started charging downstream, dropping into the foamy nastiness at the top. He managed to keep his boat straight and squeezed through the narrow crack driving left to avoid the huge roostertail at the bottom.. As usual, he made a big nasty drop look like class three..
Jesse Coombs enters the 'Suicide Line' at Horseshoe Falls. We'd never heard of anyone running this side before, but Jesse made it look easy. Jesse subs out in the narrow entrance. You have to keep your boat straight here because the crack just downstream is only about six feet wide..
Jesse charges to the left to avoid the huge roostertail at the bottom of the 'Suicide Line' at Horseshoe Falls. After Jesse ran the falls I was the only one left at the top of Horseshoe. Ever since I broke my back running Spirit I can't run the 'Gimmee' line at Horseshoe ( because it auto-boofs you ) so I run the chunky river left side. Unfortunately for me I had loaned Jesse my elbow pads, because when I dropped through the left-side crack I ended up whacking my elbow really hard on the rock on the rock outcropping that guards the right side of the crack. Other than that I had a good line, melting through the foam below and emerging upright below..
See the Bennett Guide to Washington Whitewater for a complete description and directions. There are more big drops upstream if you decide to put in higher. There are several variations of this run. 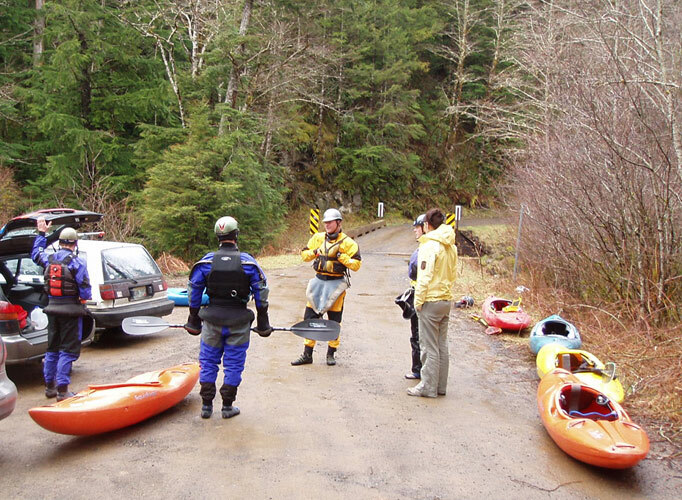 We did the lower, which includes a couple of miles on the East Fork Lewis. For flows, we had 1,100 cfs on the EF Lewis at Heisson, which was fine for the big drops but painfully low for the rest of the creek. 2,000-3,000 cfs would be a much better flow. I think 2,000 cfs on the EF gauge is what I would call a minimum flow for this run. 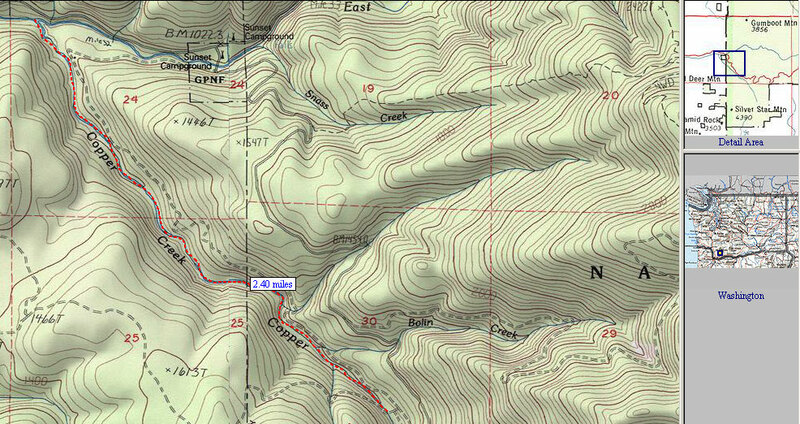 A map of the section detailed in this trip report. There are another couple of miles below the East Fork confluence.